Our dinner at the French Laundry wasn’t the first dining experience my husband and I had at a Thomas Keller restaurant. We hadn’t been married more than a year when we spent a spontaneous three-day weekend in Vegas. The trip was a blast — we saw a Cirque du Soleil show, had a fancy dinner at Mario Batali’s B&B Ristorante and even took a rather hilarious gondola ride through the Venetian hotel. You’ll notice the one thing we didn’t do — gamble. Neither of us is really into casinos and the only chips we put down were the two free ones we got from the front desk when we checked in. The trip — like our lives — focused on food, ending in a fantastically elegant meal at Bouchon a few hours before we left town. That meal would end up being our downfall. Oh, the food was spectacular, the service was incredible and we even got an impromptu tour of the kitchen. We had such a good time that we waited a little too long before catching a cab to the airport. Tipsy off too many good cocktails, I remember vividly racing through the airport, zipping through security and laughing gleefully when we realized we had plenty of time left before boarding. Looking to kill time, we wandered over to a small gathering of slot machines and thought we’d spend our change in a Vegas-appropriate manner. We kept an ear out for news of our flight but after twenty minutes or so, when we hadn’t heard any updates, we walked over to the desk at the gate. That’s when we were informed that the gate had changed and our flight had already left. Apparently they had called our names several times over the intercom, but the dings and blings from the slots had effectively shushed any announcements. The fact that I can still say the whole experience was worth it (ten times over) should attest to how great the meal was. Unlike our appetizer, this course couldn’t have been easier. The prep is minimal and (if you don’t count the overnight salting of the endive) it is ready to serve in around 30 minutes. Salting the endive seems high maintenance but it won’t take more than a few moments. Simply cut a bit of the core out of each head and submerge the bottoms in salt. Cover and let sit in the fridge overnight. 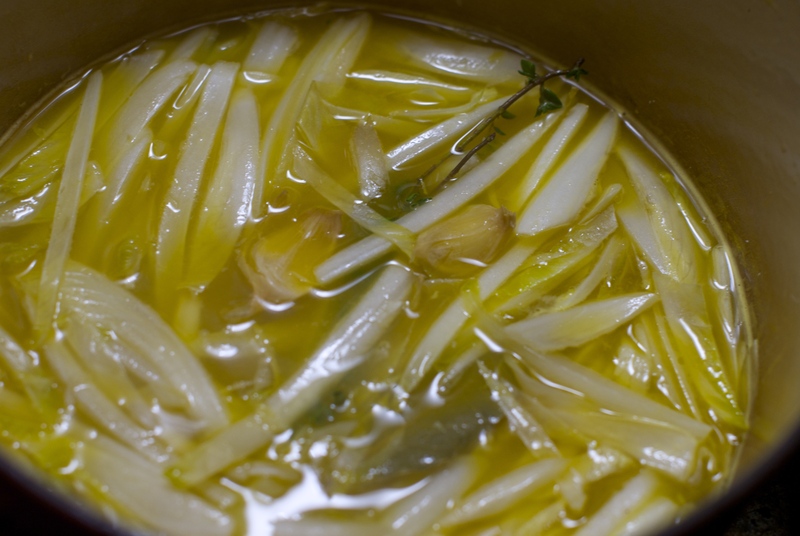 This process helps draw out any bitterness from the endive. Plus they look pretty adorable all lined up! The next day the endive is trimmed up and then sliced thinly. It cooks slowly in a combination of orange juice, chicken stock, garlic, honey and herbs until just tender with a slight bite. The sauce is mounted with butter, resulting in a gloriously tangy but rich sauce that pairs perfectly with scallops seared over high heat. While Oysters & Pearls looks and tastes like you spent all day on it, this dish seems effortless and simple, but it will wow you just the same. 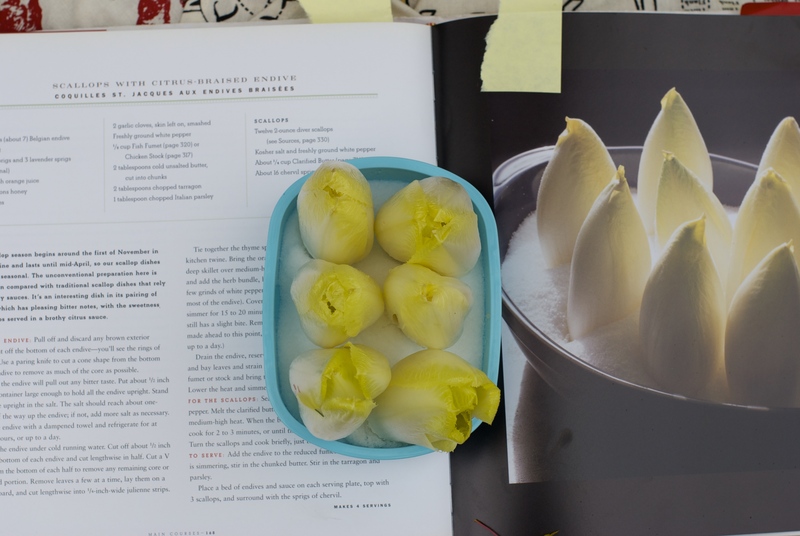 This entry was posted in Edibles, Entrees and tagged bouchon, citrus, cookbooks, cooking, endive, food, recipes, scallops, seafood, thomaskeller by Jessamine in PDX. Bookmark the permalink. OMG those endives are CUTE, aren’t they!?? Well done on the scallops. They look so good I will forgive you for eating them anything other than raw. I think the original Bouchon in Yountville was an effort to give Thomas’ low-achieving brother a piece of the Keller magic. We have one here in L.A., but I’ve never made it in. My cookbook is as close as I’ve gotten. These scallops were perfect by the way. While I love a raw scallop, I seriously heart a hard-seared scallop. The difference in textures paired with the sweetness of the scallop – oh god, so good. And these were brought in by my dad from my hometown — packed right on the ship. I have 4 more pounds in my freezer and I’m so excited. Maybe the next batch will be eaten raw! Does your dad need any new friends in Southern California!? Oh my! That looks absolutely scrumptious! I think you would LOVE this dish. In fact I should make it for you sometime. It was so delicious. What a great story! I’ve always hated endive. Especially those giant raw pieces that my mother-in-law used to put in salad. I’d push them around the plate, try slicing off tiny little bites and so forth. And she’d nicely tell me that it was just because I wasn’t Italian that I didn’t like them. (She refuses to have a computer, so I can say that with impunity!) I expect that this method would fix everything! I’ve always liked endive but this presentation really surprised me with how good it was. I’ve never tried salting it before but it seemed to make a difference in the raw flavor and, of course, I’m sure braising it and then adding a ton of butter certainly helped as well. Also glad you liked our Bouchon story. After all was said and done I was able to see the humor in it. But man, when it was happening — so awful. Talk about the worst way to sober up after such a glorious food buzz. This looks do-able, even for someone with my pitiful cooking skills! 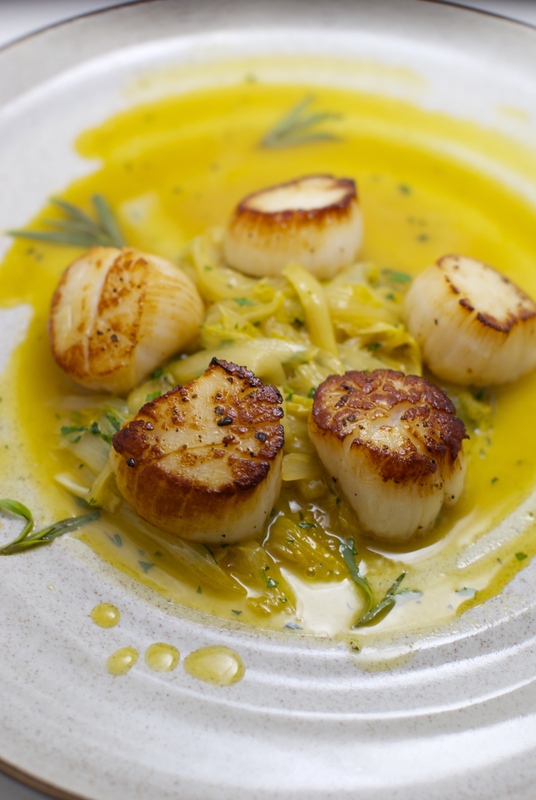 And I do love scallops–yum! And I loved your Vegas story–your blog is more than just recipes, for sure! 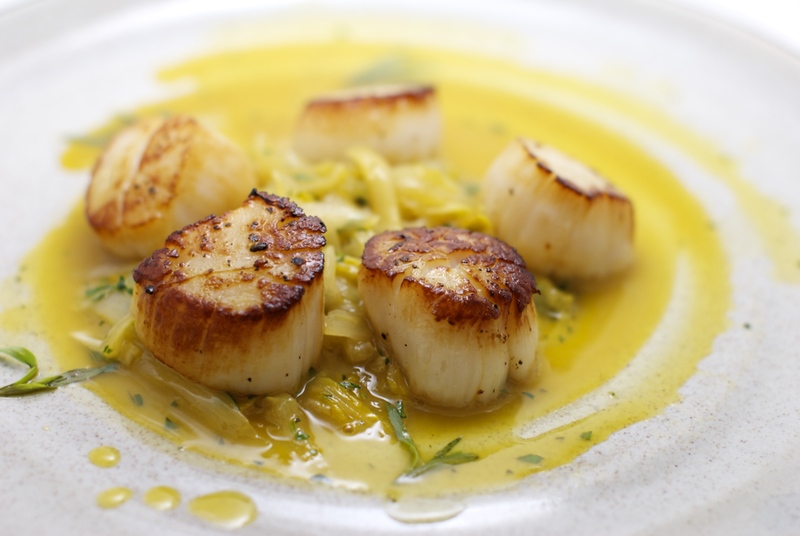 Those scallops look like they’d just melt in your mouth! YUM! Thanks! =) I felt pretty damn proud of these little guys. They seared up so beautifully! 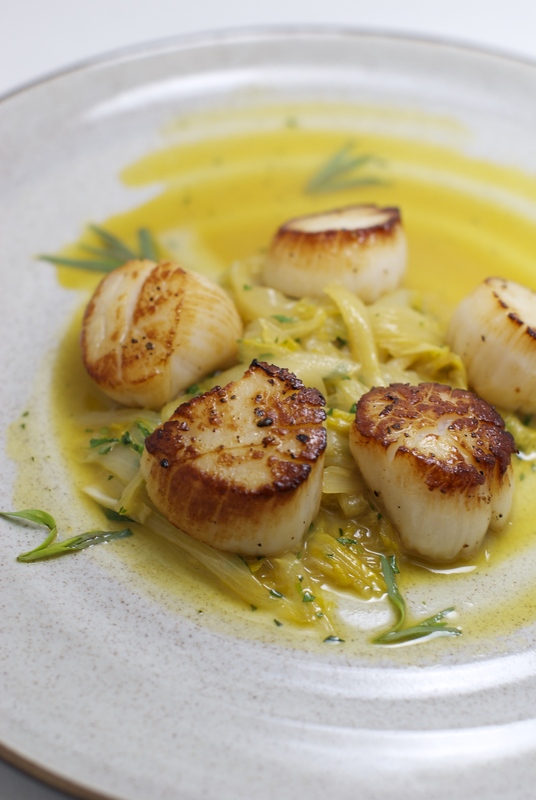 The scallops look delicious and the salt thing with endive is very clever – I love the look of endive but always thought it was a tad bitter – now I know how to fix that. Great dish!